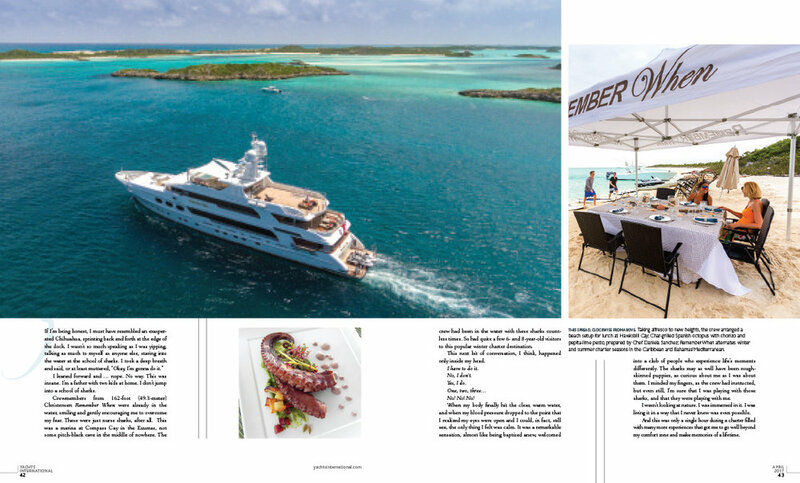 Motoryacht Remember When is proud to be featured in Yachts International’s April 2017 edition, on a fabulous article by Andrew T. Parkinson that takes you through a detailed journey of the Exumas in the Bahamas. Read on to enjoy and relive a luxury yacht charter experience. Reprinted with permission from Yachts International Magazine. 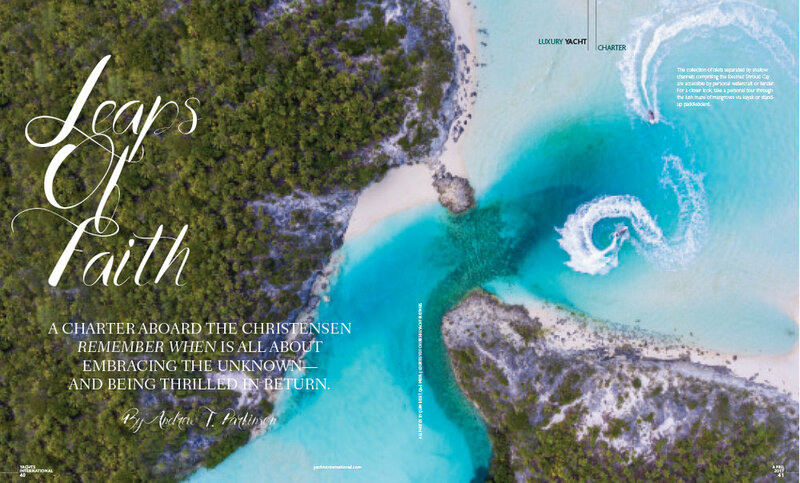 A charter aboard the Christensen Remember When is all about embracing the unknown—and being thrilled in return. I leaned forward and … nope. No way. This was insane. I’m a father with two kids at home. I don’t jump into a school of sharks. Crewmembers from 162-foot (49.3-meter) Christensen Remember When were already in the water, smiling and gently encouraging me to overcome my fear. These were just nurse sharks, after all. Thiswas a marina at Compass Cay in the Exumas, not some pitch-black cave in the middle of nowhere. The crew had been in the water with these sharks countless times. So had quite a few 6- and 8-year-old visitors to this popular winter charter destination. This next bit of conversation, I think, happened only inside my head. When my body finally hit the clear, warm water, and when my blood pressure dropped to the point that I realized my eyes were open and I could, in fact, still see, the only thing I felt was calm. It was a remarkable sensation, almost like being baptized anew, welcomed into a club of people who experience life’s moments differently. The sharks may as well have been rough skinned puppies, as curious about me as I was about them. I minded my fingers, as the crew had instructed, but even still, I’m sure that I was playing with those sharks, and that they were playing with me.